One of the more common drums in marching bands and drumlines and the primary drumA hollow cylindrical shell of any size that has a head stretched over one or both ends and is b... of a drum setA set of drums consisting of generally 4 to 5 drums or more, and used in many different musical.... 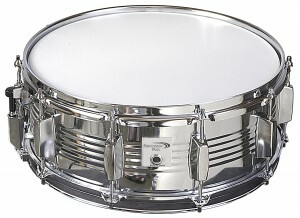 This drum contains metal wires (snaresThe long, spiral-shaped wires that are stretched across the bottom of a snare drum. These wires...) that are attached to the bottom of the drum and help create its signature ‘buzz’ sound. In addition to rock and marching band music, the snare drumOne of the more common drums in marching bands and drumlines and the primary drum of a drum set... is also commonly involved in orchestral and concert band music.